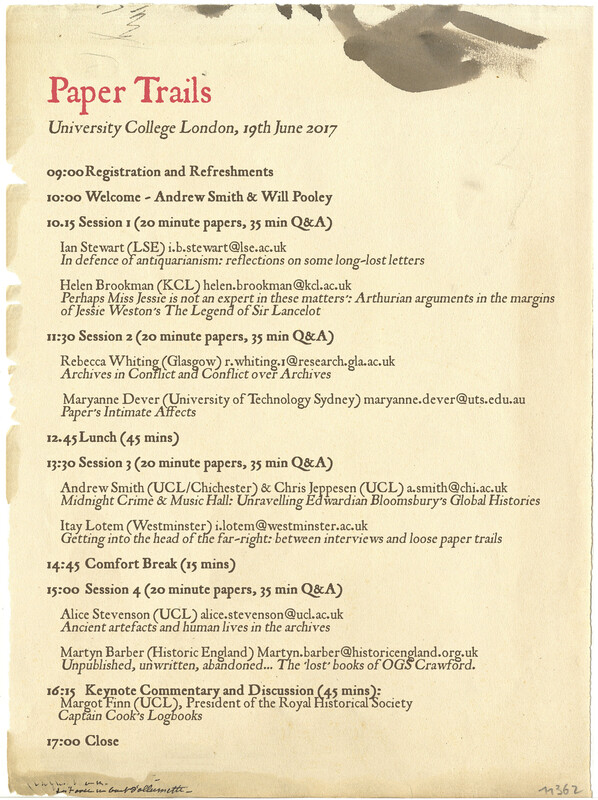 We are delighted to announce the programme and open registration for our academic workshop, Paper Trails which will take place on the 19th June 2017. The academic workshop will be followed by 2 days of schools workshops, to be held at UCL in conjunction with Newham Collegiate Sixth Form Centre. This event is being organised in partnership with UCL Special Collections and Archives Service, who have provided invaluable support and access to some of the wonderful items held at UCL. Our academic workshop will involve 8 papers looking at materials, serendipity and the social life of archives from researchers in a number of disciplines. The workshop will culminate in a discussion led by Professor Margot Finn (President of the Royal Historical Society) focussing on the themes of the day and exploring the paper trail of a document uncovered during undergraduate teaching at UCL. If you have any questions about the event whatsoever, then please contact the organisers Andrew Smith (@smidbob andrew.wm.smith@ucl.ac.uk) and Will Pooley (@willpooley william.pooley@bristol.ac.uk). At present, the workshop is scheduled to take place in the Garwood Lecture Theatre, South Wing (First Floor, Room 109) at UCL. This should be accessible for wheelchair access via Wilkins Building South Cloisters through Wilkins (South Junction Stair – Stair A), use lift to first floor and enter South Wing first corridor. You can find a map to the location here: http://www.ucl.ac.uk/maps/garwood-lt. This room is designed for 48 people; if there is greater demand, we can investigate booking a larger room to accommodate. « Future Imperfect? New book!